We begin with a short introduction to Linux, which is what is used on HPC2N's compute clusters. This part is only meant for complete beginners to the Linux operating system, and can be omitted if you are proficient already. See the schedule. HPC – What is that? All the examples can be downloaded as a tar-ball here. Be ware that it is 1.6 GB! Please bring a laptop, and make sure you have an account at SUPR as well as at HPC2N if you want to participate in the hands-on part of the training. There will be a course project that can be used to run the examples in during the hands-on. If you don't have an account at SUPR and/or HPC2N, you will be contacted with further instructions for how to sign up. Note: Participants are kindly asked to limit the use of fragrances due to perfume intolerance issues. Thank you. Time and date: 23. January 2019, 09:00-17:00. 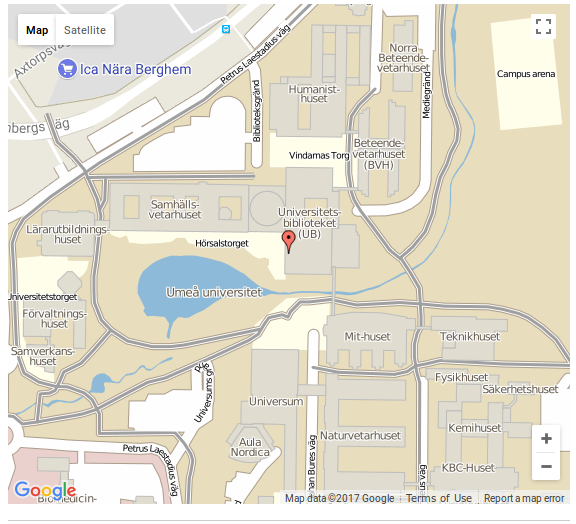 Location: MC313, MIT Huset, Umeå University (Map here) Getting to Umeå University/HPC2N: info here. Deadline for registration: 15. January 2019. Please register by filling in the below form. Fields marked with a * are mandatory.